VFD bypasses and backups: Which should you use? Advanced motor protection and consistent energy savings are possible, with true redundancy. 1. Learn the differences between traditional solutions to VFD failure and newer methodologies, and the pros and cons of each. 2. Describe a simple selection process to ensure the application is properly protected and backed up in the most economical way. Originally introduced as an efficient and effective way to reduce energy consumption by allowing motors to be run at different speeds, variable frequency drives (VFDs) have become commonplace in the HVAC industry. While there is no question that VFD technology helps save energy, unfortunately it was somewhat unreliable in the early years. The VFD bypass was introduced to ease concerns around reliability, and it played a significant role in the rise of VFD usage. A traditional mechanical bypass acts as a backup system to ensure equipment stays operational when or if a VFD fails. A bypass is essentially a motor starter that is built into (around) the VFD to maintain full voltage (across the line) control of the application. The backup allows the application to run at full speed until the problem with the VFD can be addressed. The bypass, along with the VFD, have become staples of the typical HVAC configuration, and over the years have made their way into almost all consulting engineers’ specifications. The problem is that the majority of specifications today still hang on to the idea that bypasses are always needed. VFDs, like most electronics, have improved dramatically since they were first invented. They’re more reliable now and have extremely low failure rates. They’re also much more compact and economical than in years past. 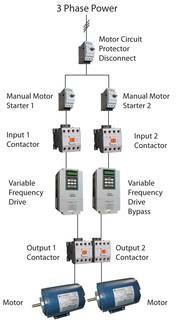 Recently, VFD manufacturers have developed new and improved bypasses, as well as motor drive packages with full redundant capabilities. Opinions abound about which backup or bypass should be used for various HVAC applications, but there are few guides that provide a definitive answer. To better understand the selection process, it’s important to first look at the pros and cons of the various bypasses and backups available. On the positive side, electronic bypasses offer features such as advanced motor protection, BAS communications, logic to assist with troubleshooting, flexible control features, and compact physical size. But these bypasses come at a higher cost. They also lack soft start capabilities and motor speed control in bypass (60Hz only). Redundant VFDs are the logical next step in control for critical applications (Figure 3). They work on the principle that if one VFD fails, full control and protection are maintained by a second VFD that automatically takes over. Redundant VFDs are not a new concept; the idea has been around for years, but only recently has this concept become cost-effective. With the VFD market becoming more and more competitive, it’s only a matter of time before bypasses fade away as a viable choice, and dual VFD systems become the standard for critical applications. Most VFD manufacturers offer some type of packaged redundant drive systems as part of their custom offering. This means they must be approached on a “job-by-job” basis. It’s important to understand that these packages require a level of customization because they consist of more than just two VFDs. To maintain true redundancy, extra power and control circuitry must be added. The standby VFD must be isolated from power while the primary VFD is running to ensure both primary and backup VFDs aren’t damaged in the event of a power surge or spike. To isolate the VFDs, mechanically interlocked input contactors should be added. Provisions must also be made to ensure that the backup VFD doesn’t sit for extended periods without being periodically powered up. VFD DC bus capacitors have a shelf life and can degrade without periodic charge cycles. 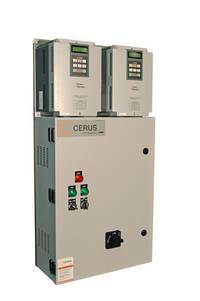 The control system should provide scheduled alternation or charge cycles for standby VFD. The downside of the added power and control components is unfortunately an additional cost. Pros of redundant VFDs include full redundancy, full control with backup VFD, and advanced motor protection all the time. They provide consistent energy savings. (VFD operation is maintained even when one fails.) However, they are more expensive than traditional and electronic bypasses and have a larger footprint. This entry was posted in Franklin Control Systems and tagged Business, cerus, Control system, Electronic bypass (smart bypass), Electronics and Electrical, Energy conservation, franklin control systems, HVAC, HVAC Applications, Redundant drives, redundant vfd, Setpoint Systems Corporation, Traditional bypass, Vacuum fluorescent display, Variable-frequency drive, VFD, VFD fail on November 12, 2013 by setpointsystems.